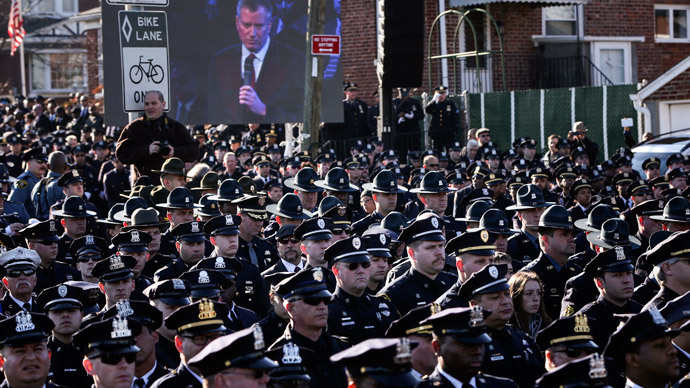 Thousands of NYPD officers turned their backs on Mayor Bill de Blasio as he delivered a eulogy at the Brooklyn funeral of murdered police officer Wenjian Liu. Officers who gathered from all over the country to honor Liu lined up for blocks outside of a Brooklyn funeral home where his body was displayed. Replicating their silent protest from the funeral of Liu’s partner last week, many faced away from the large television screens broadcasting the memorial while de Blasio reflected on Liu’s life and work. Liu, a 32-year-old Chinese-American who immigrated to the United States at 12, was shot last month along with his partner, Rafael Ramos, by a killer who said he was avenging the deaths of two unarmed black men killed by white police officers last year. Prior to the double murder, the shooter wrote he wanted to put “wings on pigs” on his Instagram. After fatally shooting the two officers, he turned the gun on himself. "As we start a new year, a year we're entering with hearts that are doubly heavy" de Blasio addressed the crowd of mourners. 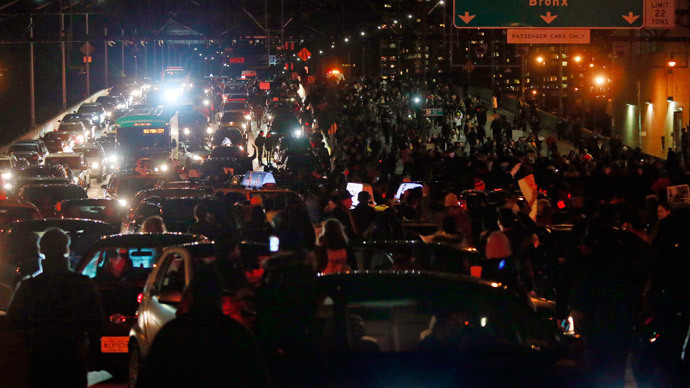 "Let us rededicate ourselves to those great New York traditions of mutual understanding and living in harmony. Let us move forward by strengthening the bonds that unite us, and let us work together to attain peace." 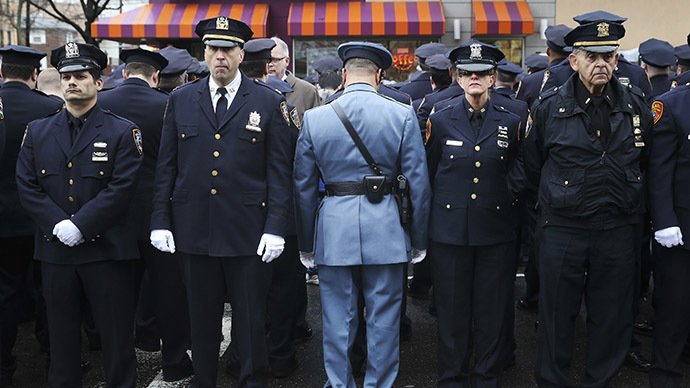 At Ramos’ funeral late last month, officers also turned their backs on the mayor, whom they accuse of fostering an atmosphere which led to the murder by supporting the mass street protests that were held after the killings of Eric Garner and Michael Brown Jr. The display of defiance was first performed by the head of the rank-and-file police union when he turned his back on de Blasio at a hospital the day of shooting. The funeral of 32-year-old Liu was delayed so that his relatives could come to New York from China, where he had recently married. 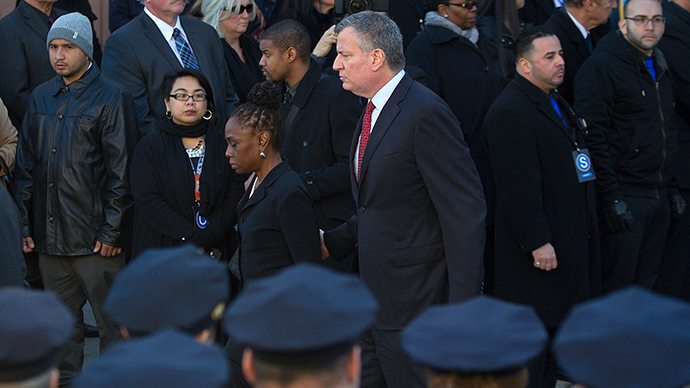 The cops’ silent protests indicate mounting tensions with de Blasio. 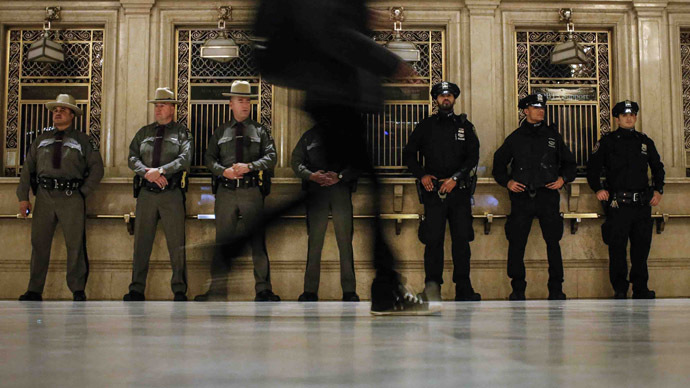 Prior to the recent upheaval over police violence, the mayor clashed with police when he criticized the NYPD’s controversial ‘stop-and-frisk’ policy which critics say unfairly targets African-Americans.